Gut the herring. Cover your body in ash. Thorn with the blood that grows from the roses. Layer dirty linens with hot water and lye. Beat the caustic bleach that forms. Seed the ingredients for medicines and food. Clean away dandruff and lice. Stir a broth of beet. Soothe a raucous child. Catch the train that runs an hour behind. Calm the cross winds. Quiet rough storms. Ache for months in your elbows and knees. Make of kitchen twine an innerscape of lace. Stew beans in a pot until they soften. Add tarragon and coriander and rosemary and thyme. Scald your hands. Sweep sand from the floor. Pile the wet sheets in a cast iron pot. Let an insect larvae curl in your hand. Shape a well-seasoned pot from clay. Fire it gray in a nearby kiln. Gather the quince and brew sour wine. Dye cloth. Don an apron. Don a wide-brimmed hat. Taper a single braid down your back. Don a wool legging. Don a wool skirt. Distill perfume. Card your skin. Be accused of treason. Be at rest. Speak in a dialect. Reproduce clothes. Eat whole fruits. Wipe your chin. Master the extraction of oils. Let tar paper cool. Collect what grew in the eaves at night. is gone. Our pews are fuming with colic. such rooms, fasten ourselves shut. sure hand steady, with nothing to cure. The mothers didn’t starve purposefully; the sons and daughters ate like hatchlings from their mouths. The children ate the bread baked and left each mother without a crumb. They ate the hens that died in the blizzard before she could boil them free of feathers. They fed at her inability to walk across the room. They drank rainwater from the cistern and sipped her salted weepings, garnered and sipped her sugary blood. They grew and grew, but still demanded to be suckled to sleep so that she had to lie contorted beside them. They cried until she gritted her teeth. They clung to her until her hair fell out in clumps that resembled the petals of dogwoods past their season. Their cries carried through the ventilation and escaped into the rooms through ancient wrought iron grates. The mothers’ hands grew more civilian each day. Their hands bittered to weeds in an overgrown garden. Their hands reflected wounds which were fatal, wounds they couldn’t feel. Hours were unwelcome as guests. Voices reigned in their heads while they fought them and then let them ricochet as if their interiors were empty. The acoustics were healthier that way. The mothers gathered at the banks of a river and dipped themselves in in the hopes of rendering their skins like iron since the battle would be a battle for years. Instead, they found themselves weeping at their unkempt reflections and at a sense of communion with the moving waters, they felt free of the little hands and mouths that haunted and crippled and pursued them; they felt moved by the natural sounds. The rivers spoke of baptisms to them, when there had been hope, and an imagined infant that had little to do with the real. Before the loss of sleep. Before the loss of all they could call themselves. Before the hunger that had the gnaw not of a single rodent but of all the rodents, numberless as rain. Their memories were like endless telephones ringing. They worshipped and got clean before they fell where they stood. They walked a few steps along rutted roads that resembled their desiccated veins. Their spines bent. Their abdomens trembled. Before they were dead, they all had been ghosts. This was where the flesh came in; it had an end, like a rope. Jennifer Militello is the author, most recently, of A Camouflage of Specimens and Garments (Tupelo Press, 2016) and Body Thesaurus (Tupelo Press, 2013). 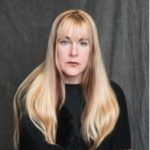 Her poems have been published in Best New Poets, American Poetry Review, The Kenyon Review, The New Republic, The Paris Review, and Ploughshares. She teaches in the MFA program at New England College.